Benjamin Jordan is 22, and a recent college graduate in International Relations. But now that he has his degree, he finds that a career in this field is not what he wants to do with his life. Instead, and against the desires of his family, he has decided to enter a world that holds much more interest for him. He has decided to follow his heart and become a freelance paranormal investigator. His first case begins with a ’phone call from a park ranger in the Florida Everglades. The Paranormal Investigator is called upon to investigate the Skunk Ape, believed to make its lair in the park - and the presumed culprit behind five deaths, each body found with limbs broken, head crushed, and liver torn from the body. The Skunk Ape itself is described as large – seven foot tall – powerful, and, most distinctly, seems to carry with it a foul smell, described as resembling a mixture of rotten eggs, mouldy cheese and dung. The search for this creature will be Ben Jordan’s induction into the world of paranormal investigation – and it will not be a gentle one. The story told is not the best or most complex or ever devised, but it fits the length of the game well, and the writing is decent enough. The graphics used to depict this story, are, on average, acceptable, if little more. This is not a game whose great strength lies in its graphics; rather they are a flaw to be overlooked in favour of its better elements, although some scenes are to my eye of particularly poor quality. The character portraits used are a little better, but are still not the best ever to grace a screen. More effective is the music, which is often quite good, suiting the theme and settings of the game well and supporting the atmosphere of each scene effectively. The player interacts with the game world entirely via the mouse (with the exception of typing in titles for saved games). The player instructs Ben to act by a simple click of the left mouse button, and the nature of the action performed is determined by the mouse cursor at the time. 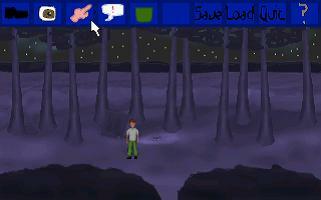 There are available four main cursors, corresponding to the four main types of action that Ben can be told to perform: walking to a spot, using an object, looking at his environment or the objects in it and talking to people, represented by a small Ben in mid-stride, a pointing hand, an eye and a speech bubble containing an exclamation mark, respectively. These cursors can be selected from via either an icon bar at the top of the screen, or by repeated clicks the right mouse button, which causes the mouse cursor to cycle through the available options. The icon bar at the top of the screen holds another icon associated with interaction with the world, but this does not itself directly alter the mouse cursor. This icon is a representation of a pocket, and clicking on it will open Ben’s inventory. In the screen opened are represented all of the items that Ben has in his possession (at least, those relevant to the game), and here the player can examine or select any of them. When selected for use, the item in question becomes a fifth mouse cursor in the form of the selected item, indicating the use of that item on the object or place on which the player clicks (including within the inventory itself, on another inventory item). 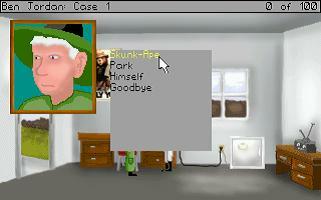 This new cursor too becomes available via right mouse button clicks, meaning that if an item is selected for use, and another action (such as walking) is performed before its intended use, the inventory need not be opened a second time to use it as the player can simply click the right mouse button until the inventory item cursor reappears. The puzzles are for the most part fairly simple, and while it is not impossible to become stuck problems should in most cases be rare, brief and fairly easily resolved. While points are awarded for discussing important topics with the characters met in the game, these conversations are not, to my mind, complex enough to be termed “puzzles” - simply exhausting all topics should suffice to gain all conversation-related points. Those excluded, the puzzles in Case 1: In Search of the Skunk Ape are entirely inventory-based, and solving a given problem takes at most two items, more often only one. Should the player forget a goal in the game, a notepad has been provided which keeps track important items of information. This is certainly a good idea, although given the brevity and simplicity of the game most players will probably have little cause to make much use of it until, possibly, the later, more complex games in the series. 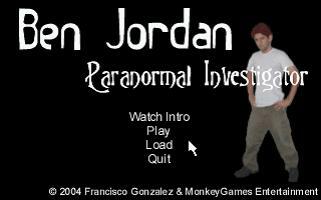 This first Ben Jordan case is brief: an experienced adventure game player should be able to finish it in half an hour or less. In a longer game, Ben Jordan 1’s shortcomings might have been a real hindrance, but in this short opening chapter, I feel that they can be for the most part overlooked. This game and the second can perhaps best be viewed as an introduction to Ben Jordan and his world; while interesting, they seem to me to add little to the overall story arc, other than perhaps establishing of a playable history for Ben Jordan and credit for the character in his world. The major overarching story arc seems rather to begin in earnest with the third case (this is based on events revealed as of the fifth game; it is possible that the events of this first case may become directly relevant to future cases). 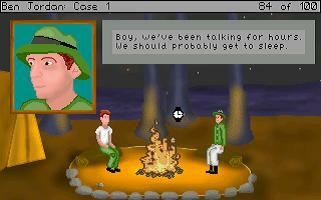 Overall Ben Jordan Case 1: In Search of the Skunk Ape is a fun game. While it certainly has its flaws, it functions acceptably as an introduction to the character. While not a game that I feel has much to recommend it in and of itself, I would recommend that players intending to play the series give this game a shot, if only to play all of the series and see where Ben Jordan came from. In addition, it is free, and a fairly small download at around 6.4MB.